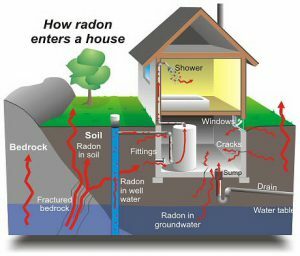 Radon Monitoring (aka Radon Testing) is a test or inspection for the presence of Radon gas or its radioactive decay products in the home. 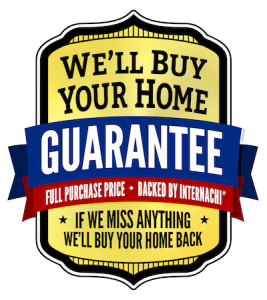 At GeoInspections, a local Kansas City home inspection service provider, we proudly provide radon inspections and radon testing in the Kansas City, MO area. This protocol for this Radon test, in the Real Estate industry is established by the Environmental Protection Agency (EPA): protocols EPA 402-R092-003 and EPA 402-R-92-004. 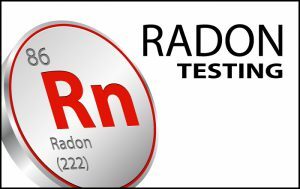 The test is a 48-hour snapshot of the radon in your home to determine whether your home has concentrations of Radon in excess of 4 pCi/L (4 pico Curies per Liter of air), the EPA’s action level recommending radon reduction. In the Kansas City metro area (Jackson County, Missouri and Johnson County, Kansas), and also a few nearby counties, we are in Zone 1 (please check out this map ink for areas of interest). The soil conditions from the underlying geologic strata in this zone is such that the average indoor Radon screen readings are greater than 4 pCi/L. There are neighborhoods in the Kansas City area that are known to typically read in double digit pCi/L. It is common to see Radon mitigation systems in certain neighborhoods, house after house, all in a row! Radon testing is performed by a Certified Inspector and monitors in accordance with National Radon Prevention Program (NRPP) and EPA protocols. The inspector is NRPP trained and uses only NRPP approved and calibrated devices following EPA testing protocols for Radon monitoring. GeoInspections uses a Continuous Radon Monitor and results are available immediately after the radon testing period. A full Radon report can be downloaded and sent via the internet to an email address(es) of the clients choosing. Nothing needs to be shipped off to a lab requiring additional delays waiting for the results. The Radon inspector is certified through the Kansas Department of Health & Environment, Kansas Radon Program, to read the results of your test and to perform radon monitoring in all 50 states. GeoInspections’ radon certification number is KS-MS-0386 and we are proud to be your local source for radon testing in Kansas City, MO and the KC metropolitan area. Contact GeoInspections at 816-506-0905 to schedule your local Kansas City Radon Testing today.